ONEKAMA — One of the best measuring sticks for judging how far a program has advanced is by the amount of recognition it receives around the state. By using that as a guideline, it is obvious that the joint Onekama, Bear Lake and Kaleva Norman Dickson drama program has reached that level. This year they will be sending Onekama High School freshman Tucker Laws and junior Emily Barnard to participate in the high school music theater Ovation Awards that will take place on May 19 at Michigan State University’s Wharton Center. The Ovation Awards are part of the National High School Musical Awards Program. It is also known as the Jimmy Award. It is necessary to first qualify for the national program through a state award and this is the first year that MSU is doing the Ovation Awards. It is recognition that local collaborative play director Amanda Harthun said they are excited to receive for their program. 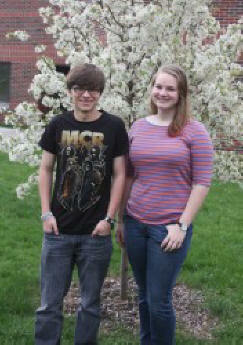 Both students made it past the first round, and were invited to compete in Lansing. There are 27 other students taking part in the Ovation Awards at the Wharton Center. Harthun said they had to get head shot pictures and a resume together, just like a regular audition for a real show. She said staff members are working with Laws and Barnard to prepare them for the big night, and they have even called in a little assistance from the professional level. Harthun said she and musical director Kathy Joseph will be attending the event as will both students parents. They will be unable to watch the activities during the day, but in the evening they will get to watch the show. Both students recently played key roles in this spring’s production of “Thoroughly Modern Millie” and have been active in the drama program for years. Laws took on the role of Jimmy in the show, while Barnard had the role of Miss Dorothy. Laws feelings about the honor were similar. “I was surprised to be chosen, but I am very excited as it something to really look forward to do,” said Laws. The audition will have many different aspects to it. Both said the experience is something that should be quite special. “Parts of it are for us to do things together and other parts are for each person to do individually,” said Laws. It’s exciting for me and just going down there is an honor. The honor also goes to three little schools in Northern Michigan who had the common goal to give the students of the districts the opportunity to take part in a theater experience similar to what is only offered at the much larger school systems. Laws and Barnard will be competing for a $1,000 cash scholarship in addition to a $500 scholarship to take part in a four-day musical workshop called ‘Take it to the Top’ Broadway School that Wharton Center sponsors at various locations around the state. The Ovation Awards will also select one girl and boy to go to New York City for a week in June to represent Michigan in the National High School Musical Theater Awards. One boy and girl will be selected to compete for $10,000 scholarship and the opportunity to work with Broadway professionals.